The New Ford EcoSport - Super Economic and Super Techy! 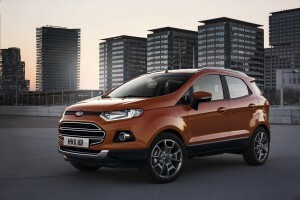 The New Ford EcoSport Debuts with Super Tech! The new Ford EcoSport is a compact SUV which, it says, is a dynamic and distinctive vehicle offering the agility of a small family car with the flexibility, spaciousness with the ‘go anywhere’ appeal of an SUV. The EcoSport also offers advanced technology through Ford SYNC voice-activated in-car connectivity system – a clever gizmo which will also dial ‘999’ in an emergency for you. (Even if you are abroad it will dial the local emergency number and speak to them in their language!). It will also be the first Ford in Europe to offer its SYNC AppLink system which enables drivers to voice-control smartphone apps from the driver’s seat. The EcoSport will be the second SUV to be launched in Ford’s expanding European range when it goes on sale at the end of this year, following the recently-launched Ford Kuga. Ford also plans to unveil the next generation of its ‘Edge’ model to the European market. This vehicle is a larger premium utility vehicle popular in the US and other markets. The EcoSport is built on Ford’s global small car platform and delivers the agility and fuel efficiency of a small family car. The all-new EcoSport will be offered with Ford’s innovative 125 PS 1.0litre EcoBoost engine, which is also the ‘International Engine of the Year’, a 110 PS 1.5litre petrol engine and a 90 PS 1.5litre diesel engine expected to deliver class-leading fuel efficiency. The SUV’s distinctive front grille, short bonnet and raked front pillars, deliver a sporty and contemporary feel and the car’s angular headlamps reinforce the modern look. It will also offer a comprehensive package of driver assistance technologies including Electronic Stability Program and Hill Launch Assist. There’s no indication of prices yet. This entry was posted in Car Updates & Releases, Eco Car, New Cars, Sports Car and tagged car, diesel engine, EcoSport, Europe, family car, ford, Ford EcoSport, Ford Kuga, Ford SYNC, fuel efficiency, kuga, LS, New Ford, new ford ecosport, price, PS, seat, Sport, SUV, technology, US by Steve Lumley. Bookmark the permalink.